Life Far from Easy for New Orleans Musicians Of the 3,000 or so musicians who have returned to New Orleans, only half say they are doing well. With many venues still closed or gone for good, there are far fewer opportunities. Yet the city remains a unique place for budding performers. 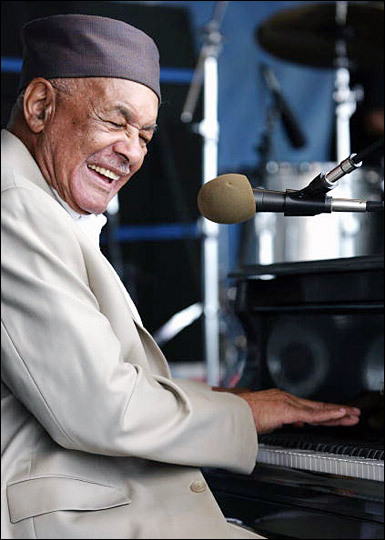 Pianist and singer Eddie Bo, shown performing at this year's New Orleans Jazz and Heritage Festival, is one of about 3,000 Crescent City musicians who have returned after Hurricane Katrina. 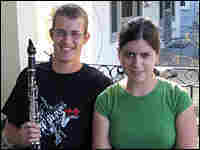 Greg Agid and Meghan Swartz are students at the College of Music and Fine Arts at Loyola University. They say they cherish their musical experiences in New Orleans but will likely leave after they finish their studies. The number 1,500 comes in handy in discussions about the plight of New Orleans' musicians. That's the number of musicians said to be back in the city and doing reasonably well. Another 1,500 are back but are leading unstable lives, "crashing with relatives" and "cramming into trailers," according to the Sweet Home New Orleans foundation. Yet another 1,500 are still away and may never return. One of the returnees is pianist and singer Eddie Bo, who is no stranger to the decades of ups and downs in New Orleans' music business. Bo (real name: Bocage) made his first dollar at age 9, playing in church. He says he could hear his mother play piano while he was still in the womb. "She played a 'junker' style like Professor Longhair," he says, referring to a banging-around Creole style of playing. The Dew Drop Inn was a later influence. It was a club with a hotel upstairs that many top-line players used as a home base. "I remember Ray Charles singing, and he was crying, and his mother had just died maybe a year earlier, and he was playing 'If I Could Only Hear My Mother Pray Again,'" Bo recalls. "The things he was doing — the chord progressions — you can't learn that in school." Bo went on to release numerous singles that became regional hits. He also worked with Ruth Brown, Joe Turner and Irma Thomas, and even had his own place, the Check Your Bucket cafe, for a while. The clubs where Bo performed regularly before Katrina haven't reopened or are overbooked. Musicians in town now often work for far less money than before, sometimes for just what shows up in the tip jar. Bo's only steady work has been at nursing and retirement homes in the area, where sometimes even the oldest and most sedentary residents are known to get up and boogie a bit. A jazz foundation out of New York pays for the gigs. Bo does have a European trip planned for the fall ("They love the New Orleans musicians," he says) and then it's off to Australia. Meghan Swartz and Greg Agid are two younger players. They acknowledge that the city's vibrant musical scene has changed, but they say it remains a wonderful place to hang out and learn. Both are students at the College of Music and Fine Arts at Loyola University; Swartz is a pianist and Agid plays clarinet. They say they will probably leave New Orleans for the more dynamic modern jazz markets of Los Angeles and New York, but they treasure their Crescent City memories. Agid even got a chance to play at the downtown club Snug Harbor, with his longtime teacher, the late Alvin Batiste. "One day he goes, 'Hey, I'm playing tonight, bring your horn,'" Agid recalls. "And he gives this big introduction to me, and I was so scared. He loved me, and he brought me up, and I feel like if you go to New York, and they bring you up on stage, they're doing it to show how immature and how young you are." Agid also points out a bright spot for musicians in the Katrina evolution. Most of the musicians who used to play at Snug Harbor haven't returned, opening spots for players who needed a break. Both Agid and Swartz — along with many others in New Orleans — speak of the city with uncertainty, about its recovery and whether there will be other hurricanes. Bo thinks there will be. With a songwriter's gleam in his eye, he says, "You know, Katrina has a sister, and she's worse than Katrina."